Whenever we try to accomplish things in a new environment, we limit it to one or two things a day. 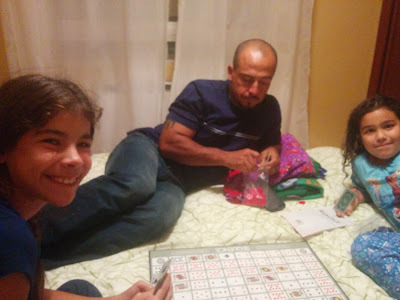 We have been trying to keep to a routine so that the girls have the time and space to adjust to a new home without more stress than necessary. Our little rental for this week has been perfect. 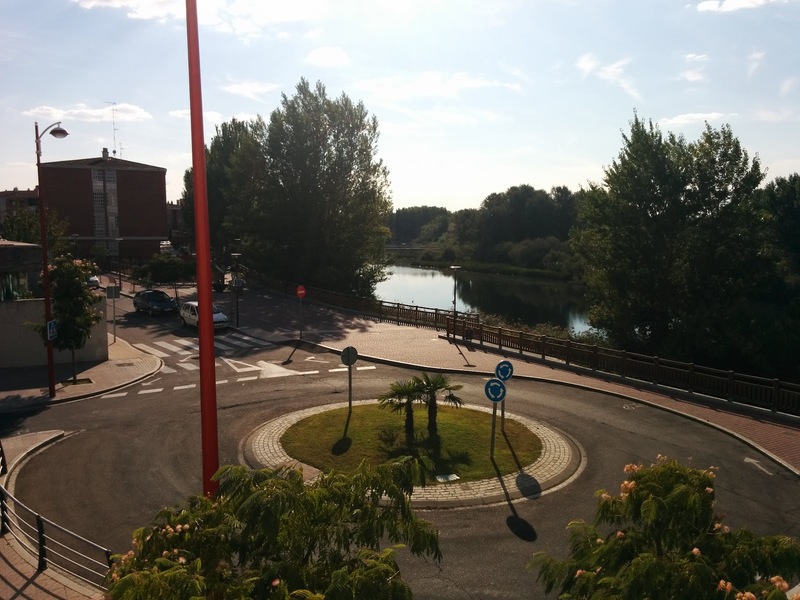 Santa Marta de Tormes is a small town right on the outskirts of Salamanca so it is very easy to get around town. I have our rental SUV for a week so we turn in the car and the rental apartment on the same day. That gives us a total of 7 days to find a new home and get ourselves situated before we move on to the next phase in our lives. Our next priority was food. 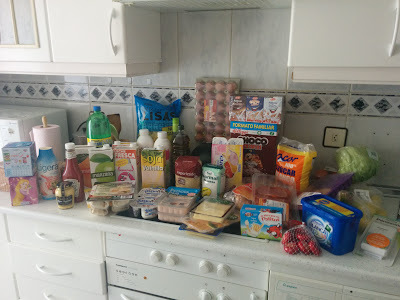 We did not want to spend all of our savings eating out and the apartment cupboards were literally bare of everything except some condiments. 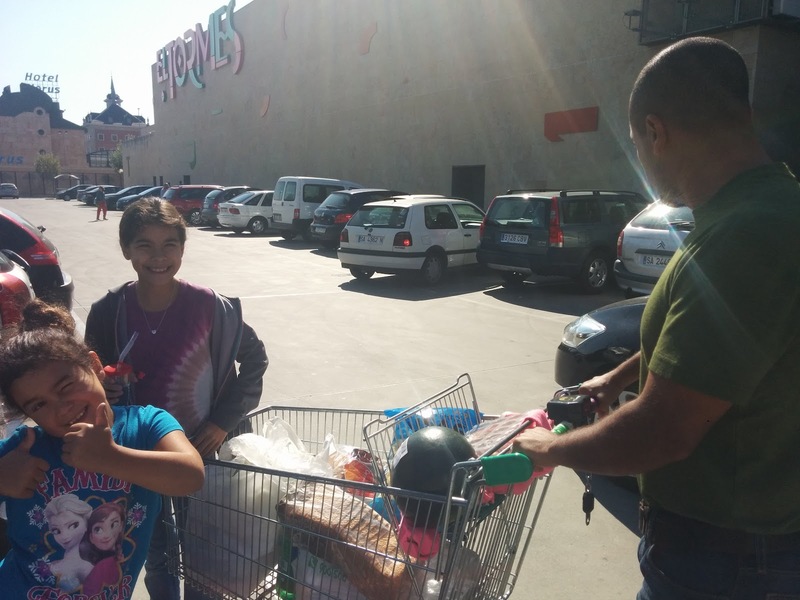 There is a mall that lies right on the outside of town called El Tormes with a Mercadona grocery store on the bottom floor. 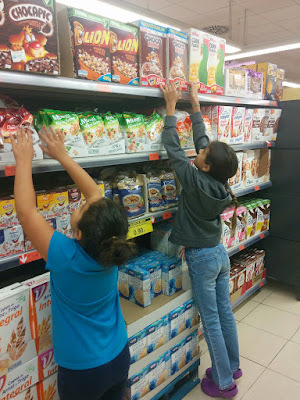 The girls were excited to find some familiar cereals to pick out as they are not heavy breakfast eaters. The hugest difference that we have found is that there are NO FRUIT flavored cereals like Fruity Pepples, Crunch Berries, anything! I see a lot of Choco Krispies, Honey Smacks, and cornflakes in our future mornings. Most of the time we spent walking up and down the aisles and taking everything in, the prices, the selection, what compares most to the ingredients that we are used to. We learned that when you are in the produce section, you have to put on a plastic glove before touching any produce and if it is a bulk product, you weigh it in that section and get a price sticker on it before approaching the cash register to check out. You can't enter the store with any bags or backpacks so there are lockers that cost .50 centimos to 1 euro to secure your belongings. When you go back to retrieve your items, your coin is returned when you insert your key. The shopping carts operate the same way. You put a euro in the shopping cart handle and it unlocks from the cart in front of it. When you return it to the cart corral, the coin is returned when you plug it in. I wish I could capture a picture that would clearly illustrate the fine art of Spanish parking lots. Those white lines on the ground are just a suggestion. Feel free to park at any angle in any direction and occupy as many spaces as your tiny car is able to. Initial thoughts, everything is sold in small packages/quantities. It is still easy to spend a fortune at the grocery store if you don't pay attention to the unit of sale. Here everything is sold by grams and liters as much of the world besides the United States uses the metric system. I will post an idea about the different costs in the near future. Wine and chocolate are pretty cheap so I'm happy over all. It is hard to find the right ingredients to make the foods that we are used to so it's a learning process. Milk is sold in cartons that do not require refrigeration until you open them. It takes me straight back to living in the Middle East when you got a little box of UHT milk with your equally little box of breakfast cereal in the DFAC (dining facility). Our search for a long term rental was a relatively short process. There are tons of websites like www.idealista.com, www.milanuncios.com, and Facebook groups for your region to help you find a home. You can pound the pavement and find apartment rentals plastered all over the streets too. We walked around town and called many numbers without any luck. I wanted a 3 bedroom piso with a bathroom and central heating so our utilities wouldn't be a big shock. An agent with Tecnocasa took us to see a three bedroom apartment that looked like it had gotten trapped in the 60's. We were advised that we wouldn't be able to get a written contract for that one though because the owner wasn't technically allowed to rent it. It is one of the requirements that we need in order to register ourselves in our town so we can get our residency cards. So that was a quick decision, thanks but no thanks. As we walked away from that lovely offer, we decided to duck into an inmobiliaria's office and see what she had available. She had a 3 bedroom with individual heating for 350€ and a 2 bedroom with central heating for 440€. She took us to see the 3 bedroom first and that was all it took. I wanted an extra room so we could host friends and family and the girls fell in love the moment they wanted into the second bedroom. It has this "lovely" black chandelier and a gorgeous of the river from all our windows. We decided to head back to our flat and think about it before committing to anything. Jose tried calling a few more phone numbers that we collected while walking back but nothing was turning up. We talked it over and ended up walking back after siesta time and letting Cristina know that we'd like to take the piso. She called the owners and set up a meeting for the next day at 10am to meet in her office and sign all of the documents. There was no type of credit check, references, or anything. She mentioned that I was a veteran and that was all it took. The owner is in the Spanish military and he said that was good enough for him. 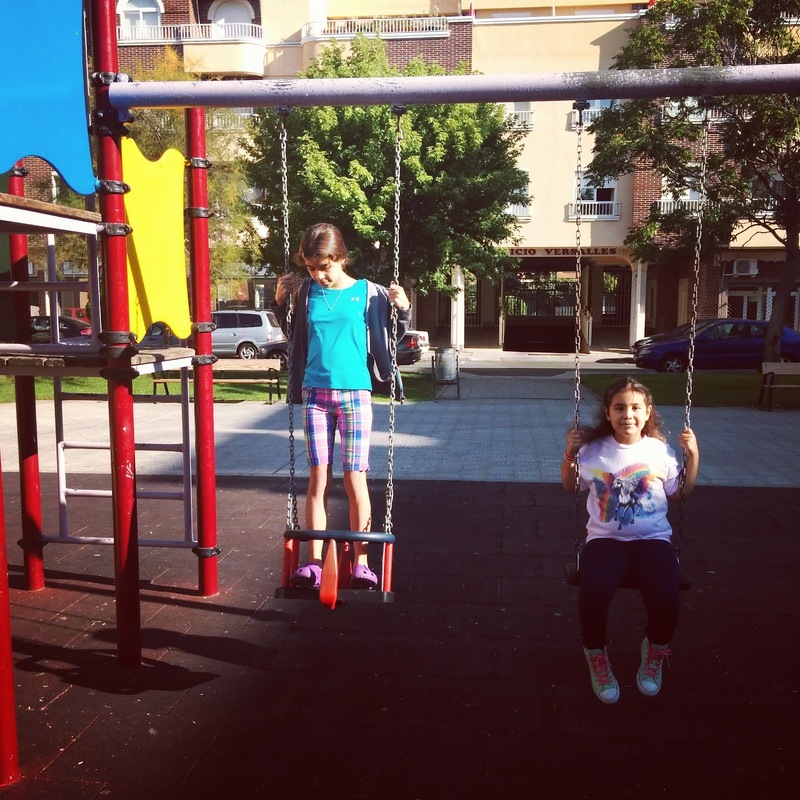 So we arrived in Madrid on Saturday the 5th, drove to Santa Marta de Tormes on Sunday the 6th, found our apartment on Monday the 7th, signed the contract on Tuesday the 8th, and moved in on Friday the 11th. We had to pay one month's rent as a deposit or fianza, a real estate finder's fee of 211€, and a prorated first month rent of 221€. The utility bills for the gas and electric will be delivered to the piso every two months and could average 250-260€ for gas and 60-80€ for electric during the winter months. This is now our new home for the next 10 months! Our new landlords are turning out to be the best part of the deal. They have been absolutely fabulous from day one and I look forward to getting to know them and their family more in the upcoming months.